Do you guarantee your wasp treatments? Jump Menu: Do you guarantee your wasp treatments? How do I know if I have a hornets nest? How big are hornets? Will bees nest in my compost bin? What do wasps eat? We treat your wasp or hornet nest. You pay us ONCE. If the nest is still alive the following day, call us, and we will return without question and also without asking for a further fee, and we will correct the issue. How do I know if I have a hornets nest? Usually, the first thing you will notice if you have a hornet's nest is insects tapping on the windows at night. Hornets are nocturnal and fly at night as well as during the day. They are attracted to lights indoors just like moths are. Hornets look like huge wasps, but they also have a rusty brown colour to them. 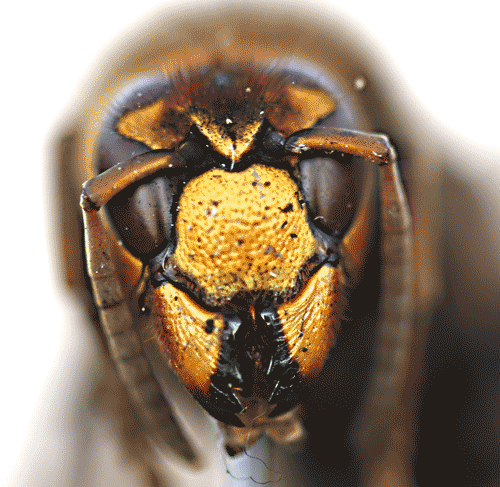 On average, worker hornets are about an inch and quarter long; queen hornets are slightly larger. Will bees nest in my compost bin? Both bumble bees, honey bees and wasps will all use compost heaps and bins for nest sites. If you have one of the above, check out our page on identification to see what you have. We also have videos on our homepage to help you identify bees and wasps. Both wasps and hornets like bees can only feed on liquid food. They can feed on nectar from plants and flowers. But most of the food they receive is provided by the young wasp larvae in the nest. Adults feed insect prey to the larvae which in turn regurgitate part of the insect (chitin) as a high-quality sugary liquid which the adults consume.